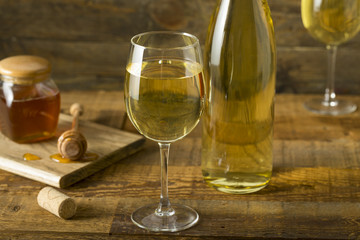 Mead , or honey wine, is an alcoholic beverage made from fermented honey and water. Its flavor is neither beer-like nor wine-like, but something unique. For many tasters, mead is something completely new. Mead is an ancient alcoholic beverage made from honey; this honey-wine is possibly the oldest alcoholic beverage in the world. Mead is even mentioned in mythology; it is said that the Norse god Odin gained his strength by drinking mead from a goat’s udder as an infant. Furthermore, the term ‘honeymoon’ comes from giving a newlywed couple a moon’s worth (one month supply) of mead. When grape wine was discovered, mead’s popularity declined in southern Europe. However, craft beer and wine connoisseurs alike have recently turned to mead for its unique flavor profile, making meadmaking a rapidly growing industry. 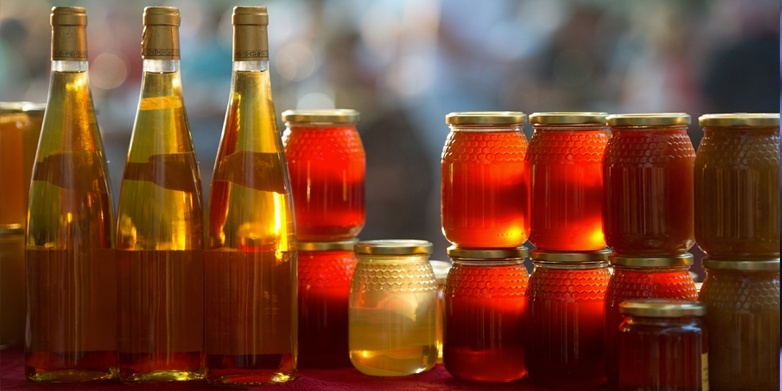 Mead in its simplest form is made by fermenting honey with water. Water is heated to around 80°C. At this point, the honey is dissolved and the liquid is aerated. The mixture is allowed to cool and combined with yeast and other additives to a sealed carboy. The unfermented mixture of honey, water, and other ingredients is known as must. Fermentation can take anywhere from several weeks to several months. After fermentation, the mead is racked, fined, aged, and bottled. The finished product typically has an alcohol content ranging from 10-20% ABV. Unlike grapes, honey is deficient in many of the nutrients required for healthy fermentation (especially nitrogen). Additional nutrients are necessary in order to support the conversion of honey sugars to alcohol by yeast without the development of off-flavors, such as a sulfide aroma (rotten eggs). 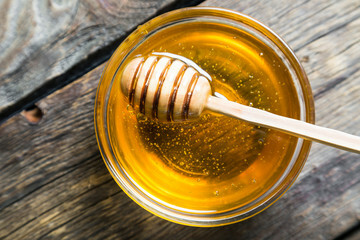 Honey provides the base of this beverage and much like grape varieties can influence the flavor of grape wine, so too can the type of honey influence the flavor of mead. You should look for honey that has been unprocessed, as can be found from local beekeepers. This will ensure that your honey is full of flavors, aromas, and colors from local fruits and flowers. The flavor of the honey can change depending on the season and location. On average, honeybees will travel up to 3 miles (4 km) in any direction from their hive to forage for plant nectar so most honeys are a blend from various hives and many varieties of flowers. Univarietal honeys are created by placing a hive in a spot where there is an abundance of one type of plant blooming and harvesting right after the flower of interest has bloomed. Controlling honey varietals helps to predict the color, flavor profile, and other sensory characteristics of the finished product. Water is also a major ingredient in mead, generally making up more than 65% of the final volume. Any clean, good-tasting water will work. If there is chlorine in the water, you will need to remove it before mixing it with honey. Another important aspect of the fermentation process is yeast. Raw, unprocessed honey will contain wild yeast spores. Like wine, meaderies may choose to add sulfites to the must to kill any wild yeast and bacteria present before starting fermentation. The mead makers then add the yeast of their choice to the must and allow it to ferment. During fermentation, the yeast converts sugars from the honey into alcohol. The combination of honey, water, and yeast will produce a traditional mead. The next evolution in your mead making will be adding fruit to make melomels. Spices or hops can also be used to create unique and different styles, but not in excess of 1 pound per 1,000 gallons. Hanna Note: Title 27 CFR 24.203 from the Alcohol, Tax, and Trade Bureau requires that a minimum of 13° Brix in the “honey must” come from honey. The wine cannot exceed 14% alcohol by volume or a total solids content exceeding 35° Brix upon completion of fermentation. The pH of mead is a critical parameter during mead production. In technical terms, pH is the hydrogen ion activity in a solution. It’s measured on a scale of 0 to 14, with 7 being neutral. Proper pH not only makes sure your honey wine tastes and looks good, but also ensures that it is safe to drink. A low pH (<pH 4.6) will prevent the growth of undesirable microorganisms and protect the mead from bacterial spoilage. However, if the pH is too low, then the yeast will be stressed, resulting in slow or stuck fermentation and unwanted fermentation byproducts. Honey typically has a pH of approximately 3.9, and the desired range for mead during fermentation is between pH 3.7 and 4.0. 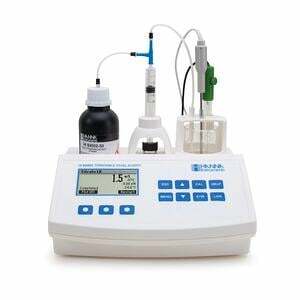 The easiest way to measure pH is with pH test strips or a pH meter. However, while inexpensive, pH test strips are subjective and based on the interpretation of color. Litmus paper only provides the general pH range and can become contaminated, which leads to inaccuracies. To be sure that the mead you are brewing is safe, it's best to use a pH meter with a digital readout. Digital pH testers eliminate the guesswork, so you can be confident that your homemade mead is within a safe and healthy range. The Checker Plus pH Tester is a pocket sized pH tester that is ideal for any budget. With a one button operation, replaceable pH electrode, large LCD screen, and easy automatic calibration, this handy economical meter is the perfect device for testing your mead brew. The long, tapered probe allows you to test the pH of your mead without disrupting your brew. The replaceable electrode extends the life of your Checker, and the automatic shut-off ensures a long battery life. You can be absolutely sure that your mead is safe to share and drink with increased digital resolution. Closely related to pH, total acidity, also called titratable acidity, is the sum of the fixed and volatile acids. Titratable acidity directly affects the color and flavor of wine and is sought in a perfect balance with the sweet and bitter sensations of other components. Too much acidity makes wine tart and sharp; too little makes wines flat and uninteresting. Proper acidity in wine is what makes it refreshing and an ideal accompaniment to food. The proper acid level of a wine varies, with sweeter wines generally requiring somewhat higher levels to retain the proper balance. Early in the meadmaking process, sulfites are added in order to inhibit bacteria and wild yeast growth. Later in the process after fermentation, sulfites can be added as an antioxidant to preserve the color, flavor, and stability of the mead. An SO2 mini-titrator can help measure sulfur dioxide additions. As said earlier, honey is a lot of sugar without a lot of nutrients. Yeast Assimilable Nitrogen (YAN), also known as Formol Number, is a measurement of Nitrogen in mead. Nitrogenous compounds, such as ammonia, must be present for healthy yeast metabolism and an efficient fermentation. Low nitrogen levels can result in slow or incomplete fermentations. 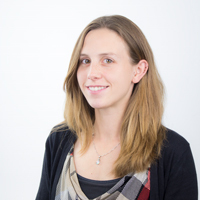 When nitrogen availability is too low in must, yeast may undergo less efficient, undesirable fermentation pathways possibly yielding hydrogen sulfide, a compound known for its ‘rotten egg’ odor. Why are Alkalinity and pH Control Essential to Plant Growth?